Tank Jacking Equipment | Hydraulic Tank Jacking system, dual-stage hydraulic cylinders to lift and horizontally build storage tanks from the top down (the return trip needs external force or dead load for returning). This enables the horizontal and vertical welding of tank shell can be conducted on the ground efficiently and safely, cooperated with submerged-arc automatic girth welding machines (AGW) and vertical welding machines (EGW). 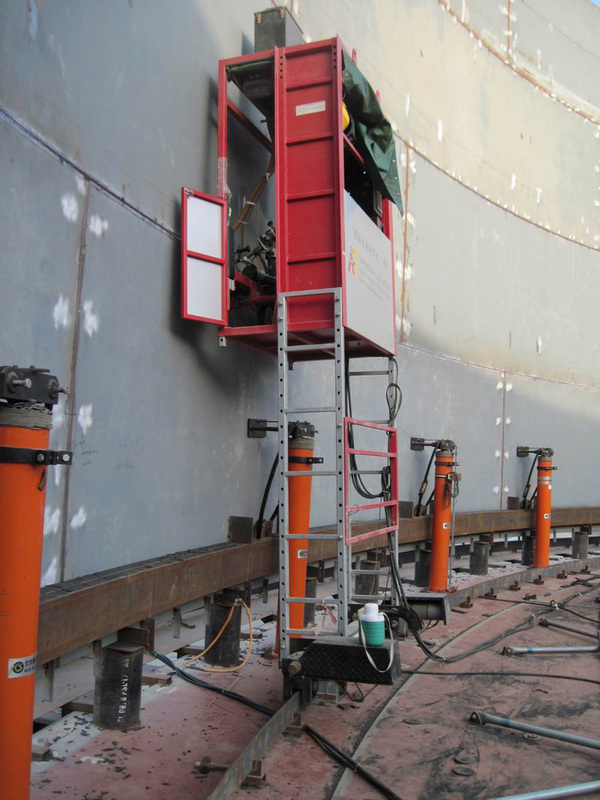 Hydraulic tank jacking system with the flexibility to lift storage tanks of different capacities and weights that are compatible to various manual or automatic welding methods adopted by tank contractors across the globe. 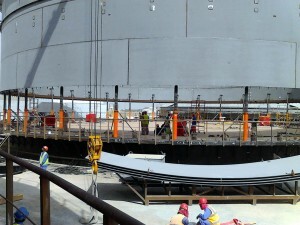 We can handle the largest tank projects and we can do it safety with maximum saving of time. Our jacks are mounted securely on the floor and using the massive cylinder as a beam, will support the structure even in higher wind loads. Each HLD jacking module has it’s own hydraulic pump and reservoir. They are linked to a central control that commands all aspects of the jacking operation. 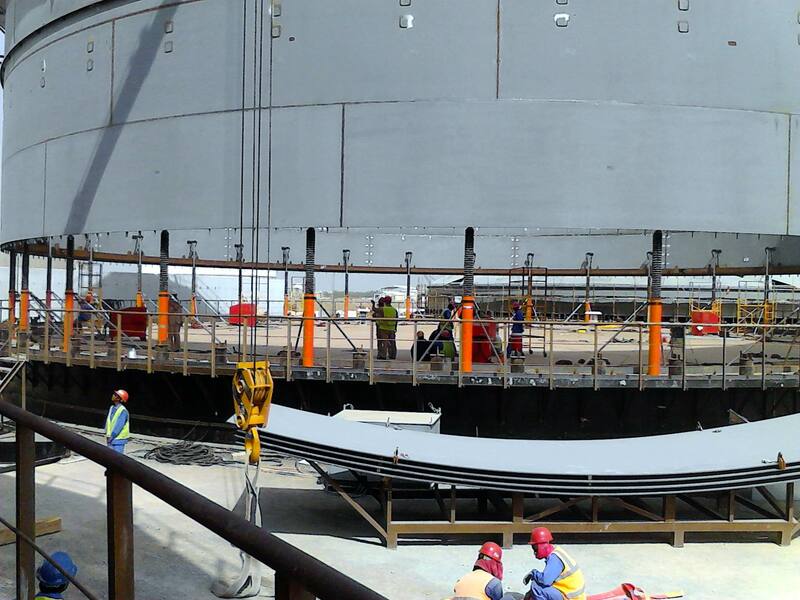 Each standard HLD jacking module with 2 cylinders is capable of lifting 50,000 kg, which allows fewer jacks to raise a tank, it is designed with a large clearance from the tank shell that gives the workers extra room to quickly insert plates. In operation, the cylinders are attached to the wall, the control loads the jack manually, or automatously via the addition of a PLC unit, then lift the structure holding tolerance within 2mm. High quality, dual-stage hydraulic cylinders to lift and horizontally build storage tanks from the top down (the return trip needs external force or dead load for returning). This enables the horizontal and vertical welding of tank shell can be conducted on the ground efficiently and safely, cooperated with submerged-arc automatic girth welding machines (AGW) and vertical welding machines (EGW). Our line of equipment includes items such as the Automatic Girth Welder (AGW), AGW-LNG, AGW-USA, AGW-LW Light Weight Automatic Girth Welder AGW-1, AGW-11, AGW-P, AGW-P2, AGW-stiffener welder, AGW-Mini, AGW-Sphere welder, AGW-Mig, AGW-Jack-UP, witch are also know as a (3:00, 3 O’clock welder), EGW-V, EGW-P, EGW-Jack-UP, EGW=Electro Gas Welder witch is also know as a Vertical Up Welder (VUP), is a single pass Vertical-Up welder (VUP), AVW-multi pass, AVW-Jack-UP, AVW automatic vertical welder, AGW-Jack-Up, EGW-Jack-Up and AVW-multi pass Jack-Up are all built for tank Jacking projects (tank jack-Up).